This storyline features the “black sphere” villains, a group of baddies that are almost literally no-names and will never be heard from again. It also introduces the Earth-2 Robin, and in so doing acknowledges that an Earth-2 version of Batman does in fact exist. (The Earth-2 Wonder Woman had already appeared at this point and E-2 Superman was two years down the road.) In hindsight, I’m wondering how wise this was. The confusing nature of DC’s multiple-Earths continuity was the original raison d’etre behind the Crisis on Infinite Earths series, as it was intended to clean it all up (at least originally; it kinda became something else later, but that’s a whole ‘nother blogpost). And the inclusion of the superhero trinity—Superman Batman, and Wonder Woman—as part of Earth-2 is where the confusion really began. Superman and Batman could have been easily ignored/erased from JSA history, as they only participated in one proper adventure, in All-Star Comics #36 (Aug.-Sept. 1947); Wonder Woman would have been more problematic, as she was a JSA regular. The core of the problem was this: Flash, Green Lantern, Atom, Hawkman… they all disappeared from the newsstands in the 1950s. Then, when they were revived in the Silver Age, they were different characters. But Superman, Batman, and Wonder Woman never ceased publication; they never went away. Thus they remained essentially the same characters from one era to the next. This was likely the most perplexing aspect of the Earth-2 concept—the Flashes were different, the Green Lanterns were different, but the Supermans et al. were the same. They were supposed to be older versions of their Earth-1 counterparts, but they weren’t represented as such until about a decade into these crossovers. For most of the history of these team-ups, there was literally no telling them apart. Hence the confusion. Anyway, getting back to the Earth-2 Robin: I’m not a big fan of him, and even less of a fan of the garish costume he wears here. It’s supposed to be a mash-up of the traditional Batman and Robin costumes, and while I usually like the more outlandish superhero couture, this one strikes me as bowling-shoe ugly. The fact that E-2 Robin has more appearances in the crossovers than the Atom, Mr. Terrific, Sandman, Wildcat, and the Spectre also sticks in my craw a bit. He’s simply not as interesting to me as those other characters. Overall, the whole line-up for the JSA here feels lacking. Again, no Fate, GL, or Flash, and I really need one or more of those guys to get really excited for the story. There’s nothing offensively bad here, but it’s the weakest of the inoffensive installments, hence its position. This one is largely a victim of circumstance. As I said in last year’s blogpost, the League was in its “Detroit Era,” with most of the big guns gone, replaced by new characters with little to no pedigree. And the plot here centers on one of those characters—the new Steel, along with his grandfather, the original Steel. 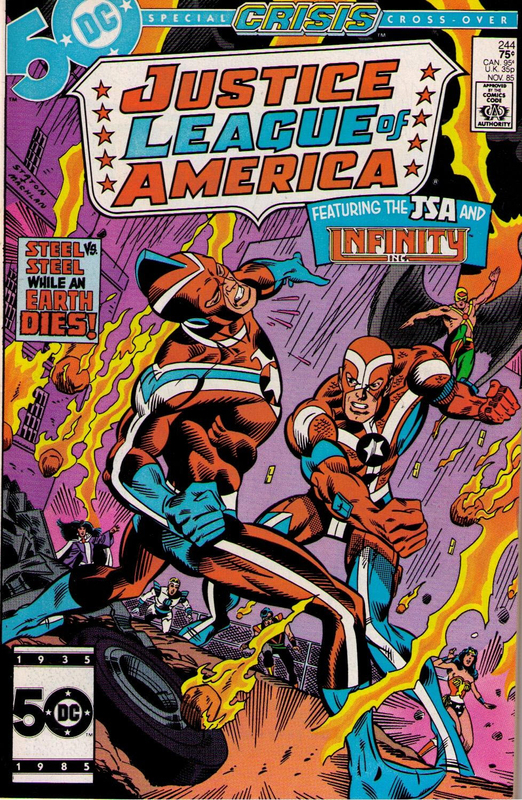 It’s not a bad story really, but grading it as a JLA-JSA team-up is rough when none of the more legendary names of the League are present. If they had been, it could have been really interesting to watch them interact with Infinity Inc., which was basically a team of second-generation JSAers. 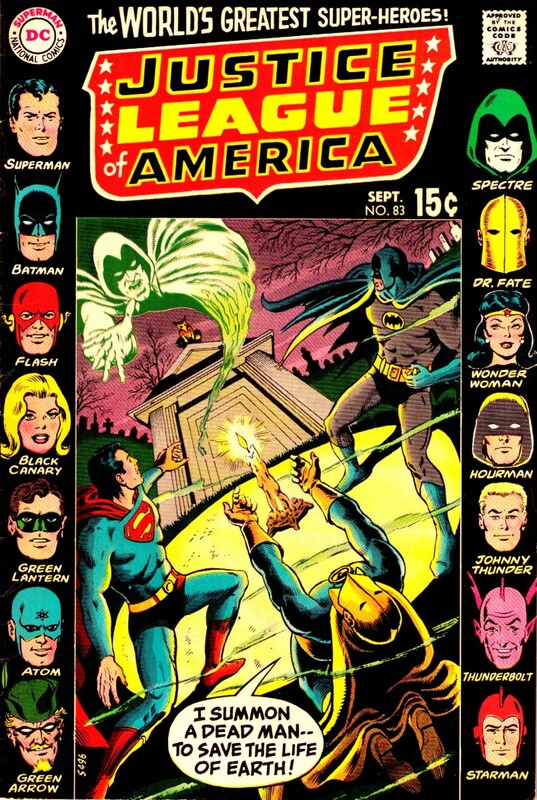 Relative to them, the JLA would have been considered the “old-timers,” which would have been an intriguing role reversal for the traditional team-up. Meanwhile, the JSA enters the plot a bit late and seems to lack presence in the overall storyline. It doesn’t even feel much like a JLA-JSA crossover; more like an Infinity Inc.-distorted-version-of-the-JLA crossover. And while I like Joe Staton as an artist (his 70s run on All-Star Comics was great), his work here was a little too cartoonish for my tastes. This was the last JLA-JSA crossover and while not a bad story, it didn’t do the tradition much justice as a finale. It would have been nice to see the tradition get a bigger send-off than this, which only ran for one issue of Infinity Inc. and one of Justice League of America. As I said last year, this had a very put-together-at-the-last-minute feeling to it. Like the year that would follow (1985, the previous entry), this storyline was also largely a victim of circumstance. 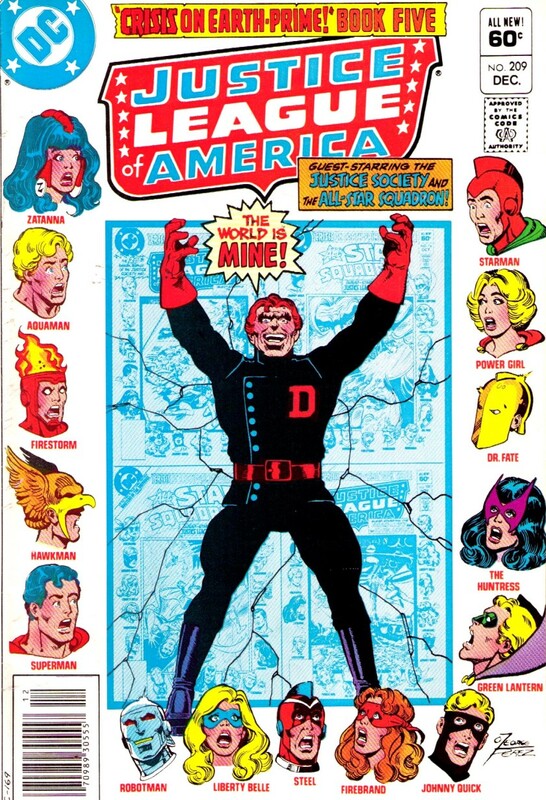 Regular JLA scribe Gerry Conway was transitioning the team into its “Detroit Era,” so most of the regulars were busy with another storyline at the time of this team-up. But in a strange way, this story probably benefits from not having more of the then-regulars of the JLA available. If you weren’t around back then, Batman had left the team to form the Outsiders; Hal Jordan had quit being Green Lantern; Atom was off playing barbarian in Sword of the Atom; and Flash was on leave to deal with his trial for the murder of the Reverse-Flash. Those are some of the absolute pillars of the JLA and they were no longer around. This story not only brings the Flash back, but it teams him with Superman, Wonder Woman, and Supergirl. Supes, Wonder Woman, and the Flash are three legit giants of the entire superhero genre, and it was exciting at the time to see them reunited. And though she was not then, nor ever, an actual member of the JLA, Supergirl still carried a lot more dramatic weight than any of the new characters that would join the JLA in the months that followed. The biggest weakness of the story is probably its villain (“the Commander”), whom I found to be rather nondescript. Overall, it’s still a good story but not great. You can tell the Batman TV craze was in full swing here, as the first installment has “Sok!” and “Pow” and “Thud!” decorating the front, while the second has Batman getting the cover spotlight. In reality, Bats was kind of a poor fit for this very science-heavy, sci-fi tale; Superman probably would have been a better choice for this one. But I digress. So Earth-1 scientist Enrichetta Negrini (a woman scientist—rather progressive considering the era) is experimenting with shrinking the space between planets in the hopes of expediting interstellar travel. Unbeknownst to her, this is causing the parallel Earths 1 & 2 to be drawn together. This leads to several beings/objects teleporting back and forth between the two worlds, including the villains Solomon Grundy and Blockbuster. The Spectre grows himself to unthinkable size as he attempts to push the worlds apart. Meanwhile, an explorer from an anti-matter universe (appropriately referred to as the Anti-Matter Man) comes poking around. A fun tale, but it probably suffers from too many moving parts. It likely would have benefited from jettisoning either the Anti-Matter Man or Grundy/Blockbuster, thereby streamlining the antagonists. The ending is also a bit corny, with Grundy and Blockbuster knocking each other out and then waking up and realizing they should be best friends. At this point we’re getting into some of the better stories and rapidly approaching greatness. This tale centers on an alien boy who gets separated from his symbiotic pet—each one needs to be in contact with the other in order to survive for any great length of time. With each of them on different Earths, the two teams have to beat the clock in order to reunite and save them, and have to do so while battling Solomon Grundy. It’s a solid story premise and well done. This installment also features the first and only all-counterparts crossover, which was a fun idea. So we get two Flashes, two Green Lanterns, two Supermen, two Hawkmen, two Atoms, and two Robins. 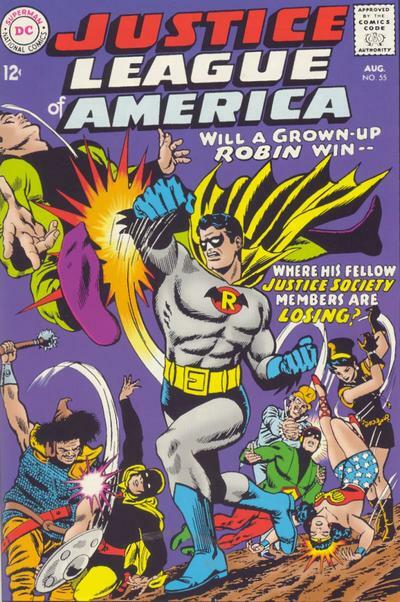 Although Earth-2 Robin had replaced the E-2 Batman in the JSA several years prior by this point, he’s still struggling with the others seeing him as a kid—a struggle he shares with his E-1 counterpart. This was some good character work. 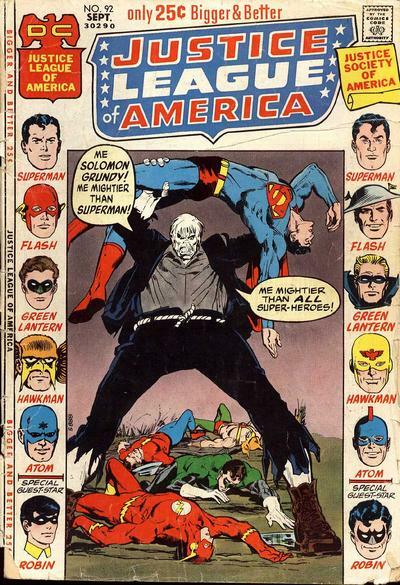 Also, Solomon Grundy is better written here than the last time we saw him (see previous entry). As I wrote a year ago, I didn’t like this one much as a kid. Going back and re-reading it today, however, I enjoyed it more than I expected. This installment continues the pattern of involving a third team/set of characters to the story—in this case it’s a group of DC’s historical heroes. There’s Jonah Hex from the Old West; Viking Prince from tenth-century Scandinavia; Miss Liberty from the days of the American Revolution; Black Pirate from the sixteenth century; and Enemy Ace from World War I. The nine-year-old me wasn’t into history; he wanted wall-to-wall superheroes. However, the adult me is a little more open to these characters and can better recognize the merits of this tale. 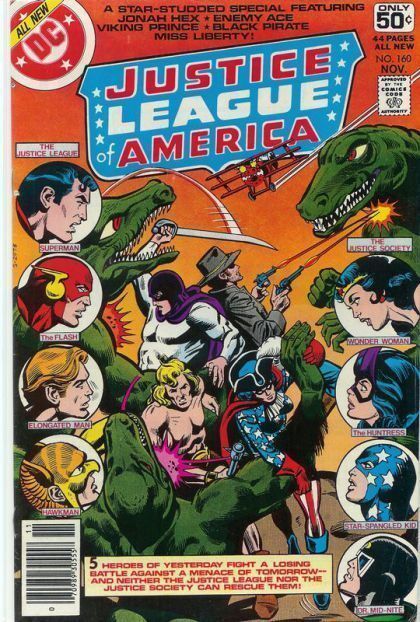 These historical characters are gathered together by the villainous Lord of Time and sent after the JLA and JSA while the two teams are gathering for the friendly, annual meeting. This is all part of a larger plan on the part of the Lord of Time, wherein he hopes to get the two teams to stop his computer, the Eternity Brain. It seems the computer has done its job all too well—the Lord of Time built it so he could travel across time and plunder at his whim, but now the computer is on the verge of stopping time altogether, which would make him (and everything else in existence) an eternal prisoner of a reality frozen in time. Of course, the time-heroes eventually turn on the Lord of Time, but are vanquished. Then the modern superheroes finally show up to save the day. While I still do not find the Lord of Time to be a compelling adversary, the scenario Conway offers, with the out-of-control computer, is an interesting one. 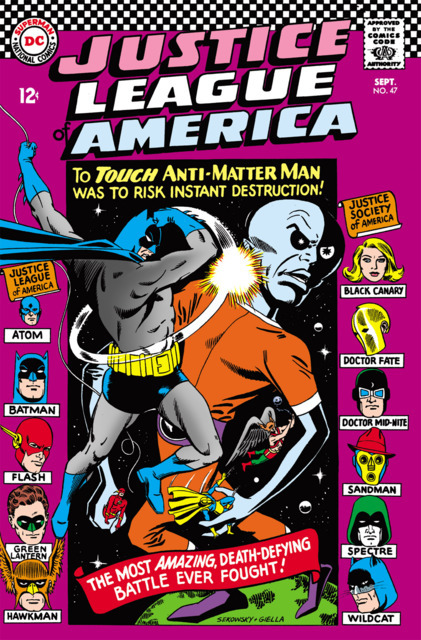 One critique: I think it would have been more dramatic (and fun) to have the historical heroes join up with the JLA and JSA to beat the Eternity Brain at the end. This nitpick aside, it’s a pretty good adventure. Another one that didn’t thrill me as I remembered it last year, but is actually a pretty good tale. If you’re meeting Per Degaton as a reader for the first time, you’ll probably like this. One of the reasons I wasn’t so high on this installment was that I have seen and read all the Degaton stories and they can get a bit formulaic in a hurry. In this particular instance, when I first read it at the time it was published, it had only been a year since Degaton had attempted similar time-traveling shenanigans to kick off the All-Star Squadron series, making this storyline feel a bit like a TV rerun. 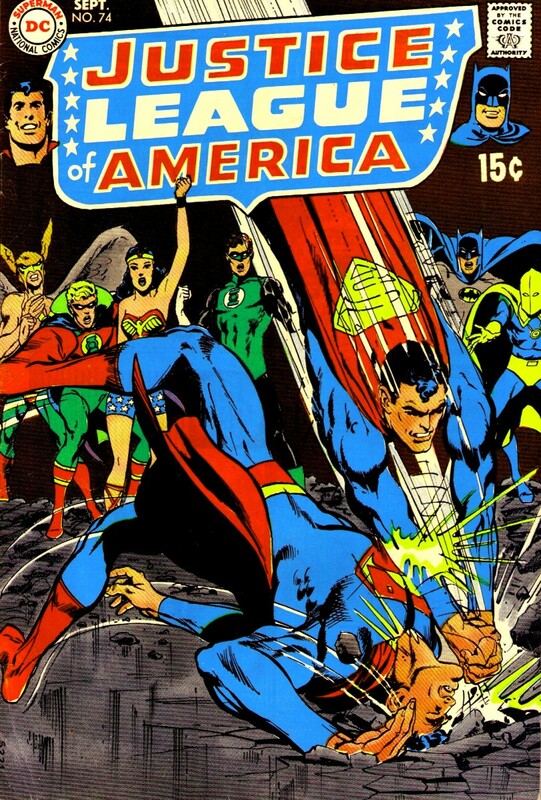 But the inclusion of the Crime Syndicate of America does offer a fresh element and the fight scenes with them are fun. Degaton’s threat of the use of nuclear weapons (stolen from Earth-Prime in the year 1962) is also a fresh component, as well as an avenue for some political discourse. There are four Earths (1, 2, 3, and Prime) and three eras (1942, 1962, and 1982) involved, but if you can keep up, it’s an entertaining ride. There’s also some interesting and poignant stuff with President Roosevelt. At one point, FDR jots down a note to himself: “Study Manhattan Project– is it worth the cost?” Later, speculating on the prospect of nuclear weapons in 1942, he says, “I pray, too, that’s a temptation I never have to face.” We know as readers, of course, that he won’t live long enough to face that temptation. I mentioned last year that the Don Heck art wasn’t doing much for me at this stage of his career, but looking at it again now, it’s not bad, really—in fact it looks good, particularly when he does his own inks. And on the All-Star Squadron side, Gonzalez and Ordway are super. These five issues also feature some of the best covers you’ll ever see, with George Pérez doing the JLA and the legendary Joe Kubert doing the honors on Squadron. As I also mentioned last year, the best, most proper reading order of these issues (in my own humble opinion) is All-Star Squadron 14, JLA 207-208, All-Star Squadron 15, JLA 209. Just an FYI. This is a good installment—if all the time-hopping and four alternate Earths doesn’t prove too confusing/distracting, you’ll likely find it to be very good. Once again, Earths 1 & 2 are being drawn together, and once again this is causing some wild side effects on both worlds. One of these effects is that when a being on one world feels pain or distress, their counterpart also feels it. So when the Earth-2 Superman gets knocked out, so does his E-1 counterpart. Ditto the two Flashes, Hawkmen, and Green Lanterns. The funny part is that Earth-1 Batman’s counterpart isn’t the other Batman; it’s Dr. Mid-Nite. Now you could say that maybe since the E-2 Batman hasn’t been active, Mid-Nite assumed the parallel role here… but then we see the E-2 Batman at a JSA meeting just a few pages later! It’s the first we’ve seen of the E-2 Batman in these crossovers, and it’s just the one panel, a cameo. The villains of the story are aliens that are led by a being called Creator2, who wants to bring Earths 1 & 2 together, causing them to explode, and then tap the energy from this explosion to create an all-new world. The story winds up feeling eerily similar to the one from four years earlier, with the Earths coming together, the Spectre needing to push them apart, and him blowing up at the end. So why is this one ranked higher than the ’66 story? A couple of reasons. First, it’s a little less busy, with less moving parts. Second, there’s no silliness here akin to the pie fight with Solomon Grundy; or Grundy and Blockbuster making friends at the end like they were a couple of Care Bears. There are also more heroes involved here, and better heroes—specifically Dr. Fate, who not only participates this go-round, but is portrayed as the total badass we all know and love. So the aliens are taking out the JSA on Earth-2, and getting a two-for-one deal as their Earth-1 counterparts in the JLA are falling with them. We get some added drama here with Black Canary thinking she might be the problem, reasoning that her migration from Earth-2 the previous year might be the cause of it all. This has her contemplating suicide as a potential solution—pretty heavy stuff for a comic book back then. Eventually, the last ones left standing against the aliens on the JSA side are Dr. Fate and Johnny Thunder & his Thunderbolt. 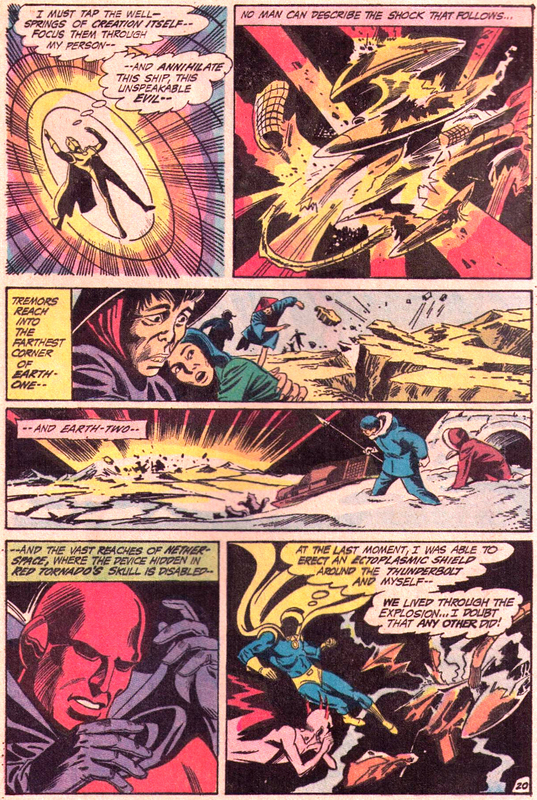 Despite his weakening “eldritch powers,” Fate teleports himself and Thunder/Thunderbolt to a cemetery for some help. There, Fate summons the Spectre. They then split up, with Spectre going to hold the worlds apart while Fate and the Thunderbolt launch a direct assault against Creator2 in his spaceship. Teleporting inside the vessel will “exhaust” him, Fate declares initially, leaving Thunderbolt to do most of the fighting. But then, when it gets down to the wire and action must be taken to save the Earths, Fate is like okay, I’m done playin’ with y’all… BYE FELICIA. So he’s exhausted and spent… but still powerful enough to blow the aliens to kingdom come AND shield himself and the Thunderbolt from the explosion. Damn. Dr. Fate is the MAN! It’s also the first appearance of the Golden Age Superman of Earth-2 (as such). As mentioned back in entry #20, the introduction of Earth-2 versions of the big three (Superman, Batman, and Wonder Woman) is probably what made the alternate Earths problematic for the DC Universe. Case in point: at this stage there is nothing here to differentiate Golden Age Superman from his Earth-1 counterpart (who also appears in this storyline). Any kid who wasn’t a big comics nerd may have been a bit puzzled seeing the two characters together in this story. Getting back to the main plot: Aquarius arrives on Earth-2 and has it out with the JSA, as recounted by Red Tornado in the first issue in the crossover. 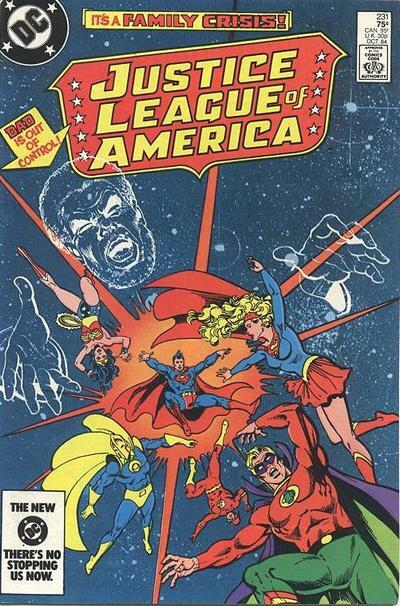 In the second issue, the JLA arrives to help out their fellow heroes, but Aquarius sets them against each other. The two most intriguing match-ups are Superman vs. Superman (depicted in glorious fashion on the cover by the legendary Neal Adams) and Green Arrow vs. Black Canary (intriguing with the benefit of hindsight, as we know that these two characters will become paired romantically later). A short time later, a funeral for Larry is held—with Superman presiding over the service, apparently. (It’s not clear which Superman, but I’m guessing it’s the E-2 version, as he would have known the Lances; the E-1 version would not.) Incredibly, Aquarius chooses this moment to show up again and taunt the heroes (what a scumbag!). This leads to a final showdown and the jerk finally gets what’s coming to him when the Green Lanterns trick him into entering a “negative” (anti-matter, I assume) universe, where his positive-matter form is destroyed. Canary then chooses to leave Earth-2 to join the JLA on Earth-1, hoping to start over and get past her grief. Like I said at the beginning, this installment gets bonus points for historical significance, as Black Canary makes the jump from the JSA to the JLA at the end of the tale (as touched upon in the previous entry). As we all know, she would go on to have a pretty big presence in the JLA as well as the larger DC Universe in the wake of this. Click below to continue to page 3!